This was my first year growing the blush savoy San Michele cabbage and surprise me, they made it out the other side of the snow drift with nice firm heads. Aren't brassicas amazing? So tough. Silty loam over clay, pH 5.5, altitude 1000m, latitude 30deg south, 150 frost free days. 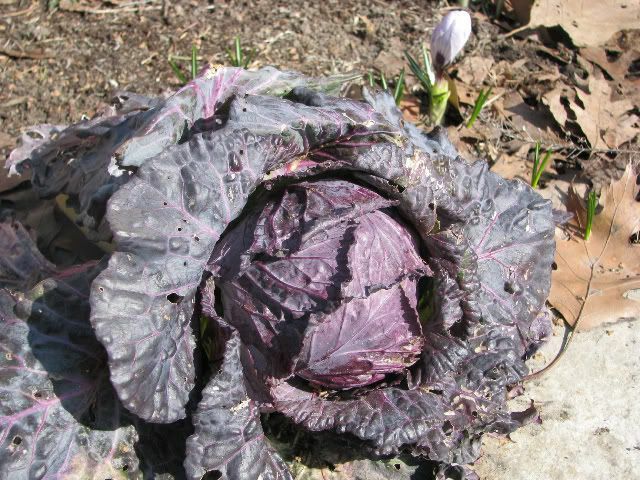 OG - I love San Michele - it's such a beautiful cabbage, great tasting, too. When did you sow it, and how big were the heads going into the winter? I've never had it over-winter, but I only tried to once. VT USA zone 3-4 Rural, about .35 acre of gardens. Soil - glacial erratic - some clay/loam some sandy/loam. Cultivation strictly with hand tools - this limits my garden size. I adhere to organic practices. No greenhouse, no polytunnels, etc. Interesting question. The San Michele in question were sown very early, around mid-April or so and were a couple weeks old at the time. I'm with you in needing to do more trialing to determine what is the best age for overwintering. Largest heads sometimes suffer from a lot of damage - water content? However, the S.M. that I left to see if they would make it through were single serving size, about the size of a grapefruit. I'll post a picture soon. Too bad they don't normally make it through for you. I was quite surprised! Maybe it was a particularly friendly year. I find it very interesting that an italian cabbage makes it through the winter...but then...is it really an italian one...in Europe, they have so many different names for the same veggies. Interesting theory about the air pockets and worth further exploration / observation. Anyone else done winter trialing in cold snowy climes? Purple colouration is cold related. It's a 'blush' savoy. Absolutely right Michel - January King had the best overwintering performance this year for me (as far as I can tell now), both mature heading plants, and adolescents. I don't like to make a sure call on brassica winter survival until we get to May and new growth is established, but our snow is pretty much gone now - a very very mild winter here indeed. We did not get near our usual low of -30F (-34C), I think we only got down to -10F (-23C). Still, the ground froze and I was concerned because we had so little snow cover. Usually we get so much snow that the ground is well insulated when the temps get very low. The air pocket hypothesis sounds right... I had at least one savoy (green - Col de Milan) in this year's overwintering trials that I included just for yucks, not expecting hardiness from a crinkly Italian. I didn't know about savoys being hardier... Anyway, Col de Milan is looking good out there so far - I wasn't really expecting anything from it, and it seems to have survived better than Offenham 3, the "winter" strain of a British overwintering cabbage, which doesn't look alive at this point. I also grew the "spring" strain Offenham 2, which may be alive, and seems to be hardier than the "winter" strain, which is sort of counter-intuitive until you think about it. I guess the Spring strain would have to be hardier than the Winter strain, or it wouldn't survive until spring... maybe.... or? I think winter or spring strains of many things are often more a matter of Days to Maturity than anything else....do not forget one thing...winter lettuce or cabbage or wheat or...or...or... are mostly europeans. Yeah winter seemed to have missed us this year. But it will come back...look, we where outside in t-shirts today and it is gonna be minus 15 tonight, minus 30 with the windchill factor.....I look at these phenomenons through a commercial, although organic, vegetable producer. We're only getting -12 to -14C tonight in Ottawa with a windchill down to -20. I was wearing my coat today but we will back up again to -2 by tomorrow afternoon and then the positive double digits by mid next week! The rocky road to spring. Yes, we're expecting your -15C tonight, then warming. It will probably wipe out all the brassicas... we have only a light dusting of snow. OG, did San Michel make it through the freeze? We have no snow at all. The San Michele seems to have made it. I"ll check it again tomorrow to see if mush is setting in. Februaries... I think I was afflicted by that as a child in Victoria... but then again that's not REALLY February.